I belonged to 808 LCVP Flotilla, Royal Marines, based at HMS Mastodon at the Rothschild’s Exbury Estate on the Beaulieu river. Just a word about how I got into the Royal Navy. In 1941 I was eighteen years old and serving an engineering apprenticeship. I volunteered for RAF air crew and passed the exams to be a navigator. I went for further tests on a link trainer mock-up aircraft and I was found to be colour blind. I was about to leave when I ran into a naval officer. He asked some questions and told me that the Royal Navy were training men from many walks of life as motor mechanics in three months. Mechanics were desperately needed, particularly with my type of experience. When I got to my flotilla I joined up with four three-month naval mechanics, three chippies, a wireman electrician, a stoker and an engine room artificer. All except the chippies couldn’t be left to do anything on their own! As an example, I sent the wireman to remove a starter motor and never heard or saw any activity so I went over and said, ‘What’s the problem?’ He said he couldn’t make up his mind which was the starter and didn’t want to take the wrong thing off! The only other item that remotely resembled a starter motor was the dynamo and that had four fan belts. One good point was that they were very nice people and didn’t mind being told. I was referred to as ‘Chief’ when I was only a PO. In the build-up to D-Day we changed into khaki battledress with Royal Navy badges, caps, white shirts and black ties. On 24 May I was on my own checking one of our boats at our jetty when I got nudged by another craft. I passed a few unseemly words, looked up and saw a matelot standing holding a flag on the Admiral’s barge with the King on board. We had a few words as I lived quite near Sandringham and his mother occasionally visited my home village. I got made a laughing stock in the mess when I mentioned it. They said I had overdosed on the rum ration. Next morning we had colour sergeant’s guard of honour for the King and he said to me, ‘Hello, young man, we meet again.’ Then we went for a service at Exbury church, about sixty of us. The senior ranks were briefed on 27 May about the date but not the location. Then surprise, surprise we had 36 hours leave, but no travel passes. I went across to Exbury post office and sent a telegram to my mother in Norfolk, telling her to come to her sister’s in Hendon, as we had leave from May 29th to 30th. Three of us set out to walk through the woods to the main Beaulieu to Hythe road where we could get a bus to Hythe. We couldn’t walk on the road as it was full of troops, tanks, lorries and red caps. It was very hot, so we were very warm when we reached the main road and my mate took his cap off and hung it on the sign post (the direction arms had been removed and just the post left so if Jerry had come he wouldn’t have known where to go!). When we got to the Hythe Ferry it became obvious his cap was still on that post. So when we got to London the first job was to find a naval tailor and buy a new hat and badge. He went on to Bradford, the other to Suffolk and I went to Hendon, where my mother and young brother were already waiting. My uncle where we stayed was a speed cop and I got a bellyful of ‘when are you lot starting the invasion?’ We all got back to camp on time. We embarked for Normandy on 4 June. I was on LCVP 1190, but it was too rough so we came back. The crew on each LCVP consisted of a corporal coxswain, two Royal Marines and one Royal Navy crewman. We had jerry cans with 100 octane petrol. We set off again on 5 June, following a motorised yacht with a light on its mast in the dark. Believe me, LCVPs were not designed for trips of 100 miles plus, in seas of near gale force. I remember lying on the stern filling up with fuel, with the crew holding my legs. Many of the jerry cans and their contents went overboard – some of them full! All twelve LCVPs in our flotilla made it okay, but it took 14 hours. We collected troops of the 50th Division and took them to GOLD beach. We got holed but we stayed afloat. All our kit bags were flooded, but our personal items were dry as all sailors put them in ‘condoms’. I still have my beach chartlet framed in my lounge. I stayed on the beach after our first drop to sort out any problems our boats had. They picked up many items on their propellers that would have needed a surgeon to identify. I slept on the beach on the first two nights, first in a crater and second in a German trench connecting two pill boxes. It felt safer. I have never heard or seen mention of the smoke screen put out on the first two nights over the fleet. Our craft used the line of old sunken merchants ships called ‘Gooseberry’ for shelter before the Mulberry Harbour was in operation. 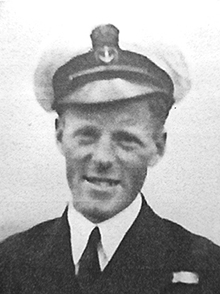 “I thought I would just drop you a few lines to let you know how things are with me… Well to start at the beginning – we crossed the Channel in our own craft in the worst possible weather conditions – you can get some idea what it was like when I tell you it took us 14 hours – everyone was bad without any exceptions & some of these chaps have been in the Marines on ships for many years, I wasn’t as bad as most thank goodness although I did sick up some blood in the end. Even now people look very doubtful when we say what we crossed in & one naval commander told us it was a feat we could be proud of for the rest of our lives & when they hand out bouquets someone has earned them. When we arrived off the coast of Normandie cruisers of the RN were shelling Nazi gun positions ashore & they kept it up until it seemed impossible for a living thing to exist on the beaches but when the craft touched he opened up all right & didn’t our boys know it but they got ashore – some of them anyhow & on the edge of the beach was a wall (you’ve probably seen pictures of it in the papers) & on top of the wall were the pill boxes & although most of them had been hit repeatedly they were still firing. I’ll say this for Jerry he certainly knows how to build fortifications. I can’t tell you what troops took that wall but in my opinion it was the most cold blooded bit of bravery that has happened or ever will happen. The beach was covered with mines & wooden posts with soft nosed shells on top & everywhere were iron girders placed this was in the sand – X X – & capable of ripping the bottom out of any kind of boat. The first time we beached with troops was when all my gear got ruined as it was on the deck & we shipped a lot of water so we had to leave the old girl to dry out under cover as quick as possible. Jerry was doing a hell of a lot of sniping from concealed positions & I dived into a slit trench quicker than that for believe me he can shoot & was sending slugs at anything that moved. The old Home Guard training certainly came in useful. Then after things quietened down a bit we got going on the grub situation & used those self-heating tins that you have probably read about. In my opinion they are the best invention yet! I spent the day ashore working on stranded craft with occasional interruptions from snipers & mines & spent the night in a slit trench on a hillside which we dug ourselves & I have never spent a more uncomfortable night in my life. I thought we had a lot of mosquitoes in England but they’ve got more than their fair share over here. The first meal in France I mentioned in my letter home. My C.O. came ashore and found me and asked if I’d had a decent meal. I said just soup out of self-heated tins. So he said come with me and we will find you something. I said how could I go with you looking like this and he said they would be pleased to see me regardless. In my first letter I did exaggerate the food position as mothers are apt to worry about such things. I saw Churchill arrive on our beach, GOLD beach, on 12 June and we were working on the beach when de Gaulle arrived on 14 June. I had needed extra help and we were making rather a lot of noise which increased when they saw the General. He was not very popular, even with Winston. Reporters and film people were there to hear his first words on French soil. He sent an officer to tell me to quieten my helpers down and to take the name of the person in charge. The RN officer gave me a wink and said that he was well known for keeping on losing things and I never heard any more. After the American harbour was destroyed their LSTs came to GOLD Beach on full tide, grounded and unloaded on low tide and left on full tide. The crews were not allowed on shore and needed keepsakes which we could very often supply. These large LSTs were manna from heaven for us as the food was first class. There was a spin off from this. Some years ago I retired at the age of 58. My wife and I went on a cruise to Alaska. We flew to Vancouver and boarded a liner there. I noticed Americans wearing D-Day hats, etc and found it was the annual outing of their fellowship. When they found out I was one of them, we were invited to join in the festivities. One lounge was decorated with D-Day regalia and members were asked to tell their experiences. I took my turn and said how kind they had been to us on GOLD beach. The next speaker said a little, then told how a ‘Brit’ had brought him a belt of machine gun ammo, which to this day was hanging on his lounge wall; he said he would like to ask the previous guest speaker how he came by it and what had happened to his red hair! We were drinking rum in special glasses, one of which I still have. We were eventually given a depot ship, a large merchant ship from the Belgian Congo. We had never before (or since) seen men like it – every face was covered with tribal markings. Obviously we couldn’t talk to them, but they were kindness itself and dried out our clothes on rails in the engine area. We also had a short spell on the minelaying cruiser, HMS Adventure, but the top brass on her decided my boats were making too much noise, always coming and going, so we had to move. One of our boats patrolled the harbour entrance, dropping small depth charges at irregular intervals in case submarines tried to enter. This had an unexpected benefit. Owing to the amount of leftovers thrown overboard the harbour attracted many fish and the depth charges brought them to the surface in a stunned state. A lot of them were collected, mainly skate. Our messman was a fishmonger in civvy street, which was handy, but eventually the frying oil supply ran out. We were on our permanent depot now – HMS Misoa, an oil tanker that had been converted to a tank landing ship. She was back from the Malta run as a cargo ship. She remained our depot until we came back in February 1945. One item I haven’t mentioned was an American LCVP we came across drifting around. We went to check why there were no crew visible. I boarded it and took it to the nearest American beach – Omaha – and tried to hand it over but they weren’t interested, so we kept it! All Yank boats were battleship grey and this one was diesel. Ours were camouflaged blue-grey and white, with petrol engines. Now we could move around independently. All the squadron except us in 808 had gone home after the initial period. I came back to the UK on 20 July with our remaining boats in a floating dock ship, HMS Princess Iris, to HMS Mastodon and one week’s leave. We were taken by lorry to the Hythe ferry with kit bags brimming full of articles that would have given customs a field day. We found five customs officials waiting for us. At this time the miniature railway on the pier was not in use so our luggage had to be manhandled to the boat and those customs chaps carried our kit bags etc to the boat and never inspected a single item! They just shook our hands and wished us well. When I was on my way home I got to Liverpool Street station and found children being evacuated again. I asked one of the carers why. Before she could answer there was panic in the carriage and the children were fighting to get under the seats. Then a loud explosion gave me the answer. That was my introduction to doodlebugs. We returned to Arromanches with twelve new boats. Through devious means we obtained our own transport and visited various places, such as the Caen-Falaise Gap, etc. Mostly we spent our time in Bayeux and got friendly with the owners of a cafe. They had taken in a small girl, who was the only survivor of her family – the others had all been killed by one of our bombs or shells. The cafe owners had a daughter about the same age. We told some yanks the story and they made sure that when we went back we weren’t empty handed. As you may know, Montgomery closed down all the so-called houses of ill-repute. One day my No 2 and I were walking in Bayeux when a lorry load of sailors off one of the battleships stopped and asked where such a place could be found. We explained it was out of bounds but they wouldn’t be put off. We followed the lorry and found them banging on doors, with the occupants shouting, ‘See Monty, he’s responsible!’ After a few minutes the door was down and my mate and I well away in case the red caps appeared. We got leave for New Year’s Eve and three of us hitched to Rouen. Then we got picked up by the French Resistance who were looking for infiltrators. They had not seen anyone dressed as we were, a mixture of khaki with naval hats, badges etc. They took us to prison, but then we got clearance and we were treated wonderfully all over the weekend. We came back to England at the end of February 1945. My flotilla went to Devonport and I went to Portsmouth. It was like losing a family. I was sent to the Far East but en route the atomic bombs were dropped on Japan so eventually I returned to the UK.